Nick Farrell has done it again. Love him or hate him, you have to admit he knows how to stir things up from time to time. 😉 This time, it was with a blog post declaring the death of “public occultism.” If I were to summarize his position, I would say he feels occult students have become millennial wannabes who believe magickal knowledge should simply be on tap. You just turn on your computer, press a few buttons, and one of the various modern occult leaders will simply deliver their wisdom to your front door in a nice box with a smile printed on it. You shouldn’t be expected to actually have to study, to practice or (Gods forbid!) actually get up and DO anything. Nick tells us of one student who canceled their own initiation ceremony because they had to go pick up a new fridge. He discusses how few people make it through the first lessons of his correspondence course – apparently because there is practical work (beginner stuff like sitting in meditation for half an hour each day) and the students just can’t hack it. I find myself somewhere in the middle. On the one hand, I’ve actually seen much of this before. I remember, during the 1990s, it really felt as if the above-quoted Biblical passage had come to pass. Magick was no longer some dark and dirty underground secret – a taboo hobby which could cost you your job, your home, and your family. No, magick was back! Magick was mainstream! “The Goddess is alive, and magick is afoot!” – so proclaimed T-shirts and bumper stickers. You couldn’t throw a stick without striking an occultist or someone who personally knew one. Covens and orders were proliferating. That stupid movie The Craft happened, I guess. (It wasn’t all bad.) For a while there, magick and paganism had become an outright fad – and it wasn’t the first time. In the history books, we see that occultism enjoyed a boom in popularity in Europe during the late 1800s and into the early 1900s. However, two World Wars put an end to that. It revived again in the 1970s and grew quite popular by the 1990s, and then the world went to hell and people found other things to talk about. Then along came Harry Potter and Hurricane Katrina, and suddenly there was a fad for ATRs (African Traditional Religions) and old-school witchcraft and wizardry (like Goetia). That latter fad, in fact, is still underway. The point is that occultism, in one form or another, seems to swing in and out of popularity all the time. The muggles find the subject either fascinating or terrifying (often both), and it makes great soil in which to plant your fantasy fiction. Ever played Dungeons and Dragons? Were/are you into comics? Star Wars? How about the works of Piers Anthony? Or Terry Pratchett? Lord of the Rings or (of course) the Boy Who Lived himself? All of these and much more are examples of some point in history where magick grabbed a hold of the public fancy and thus enjoyed a bit of a golden age – just as it did in the late 1900s, and during the late 1800s, and during the 1600-1700s, and during the Renaissance before that. So the “death of public occultism” is nothing new and shouldn’t really raise any alarms. In fact, I dare say it is part of the natural order of things. A fad comes along, during which large numbers of people enjoy exploring the occult sciences. Then, as expected, the largest number of them move on to the next shiny thing and occultism is left with the very few who were truly called to the Path and have something to offer. Those few then become the teachers of the next crop of aspirants – once the next Tolkien or Rowling comes along to get everyone excited again. But it’s not just the CM community that seems to be in a slump. Attendance at Pagan Festivals has been down over the last couple of years. And the class I hosted only a week ago on the subject of working with ancestors (using a boveda, something we learned from our ATR experiences) had a truly dismal turn-out. Yet the same venue has no problem filling seats for New Age classes. In fact, my wife and I have both noticed that the shop itself has, over the years, progressed from being an occult shop where Pagans hang out to a semi-Pagan/New Age shop where New Agers hang out. And this has been in reaction to the market, not a decision made by the owner. You see, the biggest and fastest-growing occult fads out there today are the New Age (yes, still) and Chaos Magick – both systems of E-Z Occultism that encourage you to just make it up as you go along. No study. No work. No effort. Just play. These are the trends that I personally find worrisome. It all seems to come down to the millennial mindset of on-tap information and instant-gratification. The belief that anything worth having isn’t worth working or searching for. And, my all-time favorite, the ridiculous jackassery that leads students to honestly believe they are there to teach the teacher rather than the other way around! (At that link, the blogger states: “A core tenet of the WMT is reincarnation therefore there may be some younger people who remember way more than their older counterparts.” I assume he wrote that with a straight face, but I don’t see how.) Many teachers are finding it necessary to either stop offering classes, or are dumbing them down and converting them to New Age nonsense in order to sell seats. The fact is that occult information has become too easy to find. Worse than that, occult leaders are too easy to contact. There was a day – even as recently as my younger years – where an aspirant had to seek and quest for many years to find the occult. The only popular literature out there was a Time-Life series called “Mysteries of the Unexplained” (hey look! you can still buy it!) – anything else had to be sought out one painstaking bit at a time. And that was just the books! The possibility of actually meeting or even conversing with one of the leaders of the occult underground was the stuff of fantasy. And when you did meet one of them, you respected them. You feared to annoy them with your puny little questions, and you took their answers seriously. I can understand why students don’t want teachers who walk around like Ascended Masters and talk down to everyone around them. That’s an extreme. But the other extreme is to have easy access to nearly any occult leader you could want, where you can just drop them an instant message and have your questions instantly answered. No need to seek for the answer, or even just look it up in a book already on your shelf. Hell, don’t even bother with Google! Why should you when the current teachers are right there on demand? In the early days of the Information Age, we teachers tried to step up and help everyone we could. We had gone it alone, and we knew how that sucked. We were in awe of the technology that allowed us to communicate with students like we had never done before, and we used that to help as many seekers as we could. But what you, dear reader, likely don’t grasp is that this state of affairs just kept growing. In the beginning, I helped every single person that wrote to me – both laypersons who needed magickal help and seekers asking for guidance. I even guided a couple of people through their own attempts at the Abramelin Rite. (And, O’boy, was that a bad idea!) But, very quickly, I found myself overwhelmed. Between email, internet forums, and social media sites like Facebook, I was receiving more requests than I could possibly answer. None of this would be such a problem if occult leaders weren’t so easily accessible. I believe that we have freely given of ourselves so much that we have inadvertently devalued both our art and our experience. We have saturated our own markets with free goods (that being ourselves). I think it is time for the serious occult teachers to consider reducing their availability. I’m not suggesting we should disappear from the Internet entirely. But we need to pull back. We can write books, articles and blogs and even interact in online groups. We can still give interviews and appear on podcasts. We don’t have to vanish into obscurity. But we seriously need to pull back a little, and stop trying to be occult white knights riding to everyone’s rescue. Students should learn every scrap of magick they can from the written materials before they come to us. Then they should feel fortunate when they can get a private word or two with us – because that is what makes them value what we have to say. “Public” occultism is on the way out (at least until it rises again). So we won’t have the luxury of hosting standing-room only lectures and conferences the way we could just a few years ago. We aren’t going to get rich. (Not that we ever were…) And we will be dealing with smaller numbers of students – but with any luck that will also mean we will be getting higher quality students. Let the tourists go find the next shiny thing. In time, I left the Annunaki behind. It was largely out of respect, as I discovered that I didn’t know how to work with Them properly and that I should probably be focused more on the “Gods” of my own time and culture – that is the Archangels and Angels found within the Qabalah and the Solomonic texts. Yet, I don’t think I said goodbye to them forever. Somewhere in the back of my mind, I know that I’ll return to Them again. That point was driven home a few years ago when Tabatha Cicero created her own Babylonian Tarot (for which, I am proud to say, I handed over to her all of my own research on Sumer-Babylonian language, myth and magick). This list is by no means complete, but should be a great start for anyone interested in these subjects. I’m sure I”ll be expanding this post over time. So stay tuned! Ok, I doubt many of you actually think 2012 is the end of the world. However, the media sure is having a field day over the subject. And what they are popularizing as the “2012 prophecy”, in fact, has absolutely nothing to do with what is actually happening . Yes, I said “actually happening.” There is something happening this year – and in fact has been happening for quite some time. 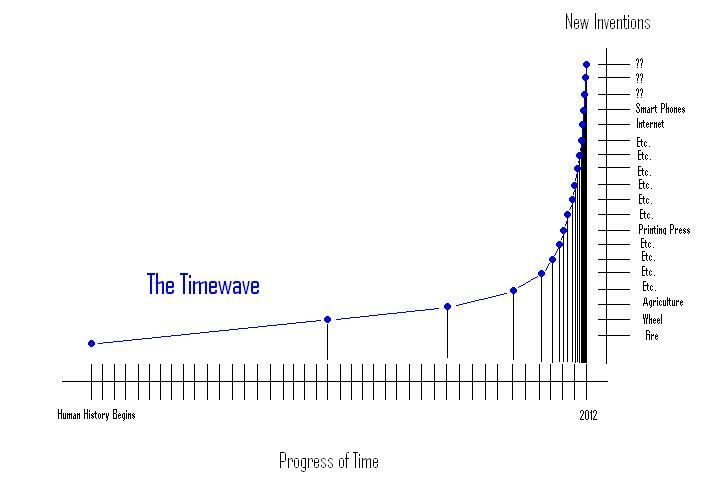 If you are one of the very few who actually understand McKenna’s Timewave Theory, then you know what I’m talking about. If you have no idea what the hell “Timewave Theory” means, or who Terrance McKenna is, then believe me when I tell you that you know nothing about 2012 – regardless of what you’ve seen on T.V. or in movies. So, I want to take this oportunity, as my very first post of 2012, to bring you folks into the inner circle of the 2012 prophecy and the Timewave Theory. It all began with a rather simple observation. Every once in a while, we invent something so huge, so revolutionary, that it utterly changes the way human beings live on this planet. We’re talking about BIG stuff here, like the taming of fire. Or the invention of the wheel. Or the creation of farming. Not just day-to-day conveniences, but things that literally make the humans who lived before the invention a completely alien civilization when compared to the humans who came after the invention. McKenna looked back over the course of human history, and noticed a specific pattern in our progress: It seems that each new revolutionary invention comes along in about half the time as the previous one. So, let’s say it took us 10,000 years to tame fire. Then the wheel would have come along 5,000 later. The next major innovation would have come 2500 years later, etc, etc. Now, let me make it clear that the above chart is in no way scientific or even close to an accurate view of human history. I just threw it together with a few example inventions to illustrate the point. As you can see above, as time progresses, humans come up with new revolutionary inventions in half the time as the previous revolutionary invention. This causes the Timewave itself to curve higher and higher – until it finally goes vertical. That vertical line means that we are inventing world-changing new technology each and every second of each and every day. And that’s impossible, isn’t it? Everything you buy will be obsolete – and seriously so, like an 8-Track tape would be today – before you could even get to the check-out counter to purchase it. Cities would have to be re-designed over and over again every day in order to keep up with new advances. Your day-to-day life would change as drastically each day as it has changed over the last 50 years. Future shock would be at an all-time high, meaning more and more people would develop psychological problems akin to post-traumatic stress disorder. So what can we imagine might happen after the timewave has crashed? MnKenna himself admited that he didn’t know. I can’t personally predict a thing past 2012, and I’ve encountered other futurists who say the same. McKenna has made a few suggestions of what we might expect, as have others – but they all admit they are purely speculating. Just tossing out ideas on what could possibly come after 2012. One is that, perhaps, we’ll finally invent time travel. Yes, that is far-fetched – but it would invalidate the entire graph above, allowing us to move anywhere on the timeline we wish. Another idea: perhaps aliens will finally reach Earth this year. It’s a bit less far-fetched than time travel. And the influx of new alien technology would also invalidate the above graph, starting a whole new technological age (and thus re-booting the Timewave chart at zero). I think the most level-headed theory is that 2012 will simply mark the end of an age, and 2013 will launch a new one. The chart reboots to zero, and we begin the path of progress anew. And/Or, perhaps we will simply hit a technological plateau where little to nothing comes along that might be called revolutionary. Whatever is going to happen, it is fast approaching. It has been happening for all of human history, but today we are getting to see its culmination. Have you noticed the social upheaval and mass uprisings of the past decade – and especially over the last year? Have you noticed that every single thing that has ever been popular is, currently, popular somewhere right now? Truly this is the culmination of human history. It’s all happening Right Here, Right Now. Maybe it will reach critical mass this December – or maybe it’ll happen sometime later. (This isn’t hard science, folks.) It is hardly the end of the world – but it is certainly exciting to witness! I urge you to share this blog post on your Facebook, Google+, blogs, etc. The popular misconception of 2012 as the “end of the world” is selling us all short. We are poised to witness the most intense moment in human history, but the T.V. has you all looking the wrong way.